The protests kicked off last week, after the government approved the new Income Tax Bill (ITB), which has been opposed by the majority of Jordanians since it was first discussed by the parliament last June. In June, thousands of people turned up to the anti-ITB demonstrations, including Jordanian unions, parties and civil society groups. However, none of those parties have endorsed or officially taken part in this week’s protests. 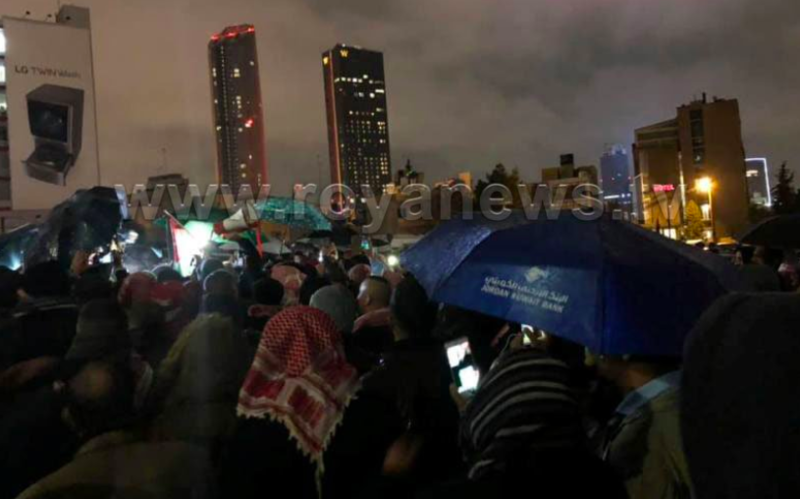 In fact, the Professional Associations Council, an umbrella for dozens of unions and the largest civil society group in Jordan which led June’s demonstrations, "has denied having any involvement in the recent protests," according to The National. In a statement issued after the first demonstration last Friday, the Council said that they “still do not know the identity of those who called for these protests,” while stressing that the unions did not call for any protests. Meanwhile, both the General Federation of Jordanian Trade Unions and the Civil Alliance Party denied taking part in this week's protests.